A couple of days ago I wrote about my first experiences with the Fujifilm team in Tokyo and I promised that I would follow up with some more images from that trip. This trip was hosted by Fujifilm Japan, but my friends from Fujifilm Belgium asked me if I would like to stay a couple of days longer to shoot a book for them with my impressions of this crazy city. In this post, I'll tell you a bit more about how and why I shot certain pictures and about the process of shooting for a book. I arrived in Tokyo a bit before lunch time after a long flight without any sleep. My plan was to get some sleep immediately but in the lobby I ran into David and Zack. Now these guys are heroes to me, so there was no way I was going to decline their invitation to join them for an afternoon on the streets of Tokyo however tired I felt. After an hour in the incredible heat I felt so weak that I had to drink two liters of energy drink to stay on my feet but my eyes worked overtime. I just let all the weirdness come to me and shot the hell out of it. I still don't have a clue what this was all about. Lots of people trying to push dolls into the pavement or something. The next two days were dedicated to our presentations and a lot of meetings. But that didn't stop me from shooting. I have the habit of always trying to make some nice shots of my friends in action. You never know what they can use them for. It's also a good way to pay it forward and hopefully get some pictures of yourself in return. I never really had any problems with jet-lag before, but I got a really severe case of it in Japan. I never got into the Japanese rhythm which led to some embarrassing moments after I fell asleep during a meeting but it also made me go out to shoot at the craziest times of day. The book I was shooting for Fuji Belgium was about Tokyo around the clock, so all in all, the jet-lag came in handy to cover all 24 hours of the days. During the meeting days, I woke up around 4 or 5 am and since I couldn't sleep anymore, I just hit the streets with my camera. When I noticed this lady's zebra pants, I started stalking her, hoping she would walk over a pedestrian crossing to match the pattern ... after 10 minutes she did. We had the chance to test out prototypes of the 23mm f/1.4 so a lot of my images on this trip were shot with that lens. During travel assignments I shoot pretty much anything and everything. In an exotic crazy place like Tokyo it's often pretty easy to come up with a couple of centerpiece images. But for a book (or an article) you often need a couple of less spectacular but nonetheless necessary images. I like food way too much to have the patience to shoot real food images, but even a snapshot can come in handy. This was shot in the hotel bar, very late at night. It's more about the visual texture than about content but graphic designers love that stuff. After all the meetings were done, Kevin and I agreed to go for a day of sightseeing together. We had planned an early start that morning but when I got up I felt really terrible. I had a headache, my stomach did things it isn't supposed to do and I seriously considered staying in bed for the rest of the day. Thinking about all the stuff I would miss, I decided to give it a try anyway despite feeling like I could throw up at any minute. It didn't particularly help that our first stop would be the Tokyo fish market. 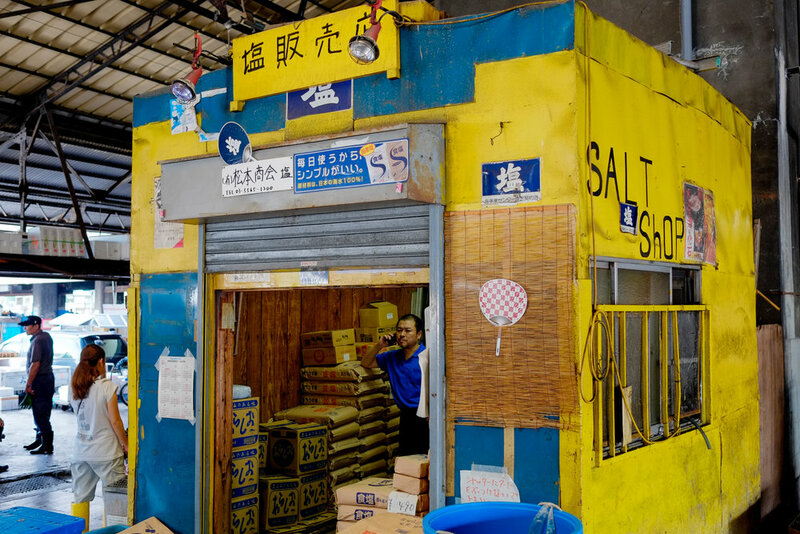 Although the fish market attracts a couple of tourists, it is in the first place a place where a lot of people work really hard to move a lot of fish. The fish market is not an easy place to shoot. The light is challenging, you have to watch out not to get in the way and it's a bit messy. On the other hand, this gives you opportunities for layered pictures that require the viewer to look at your image a bit longer. 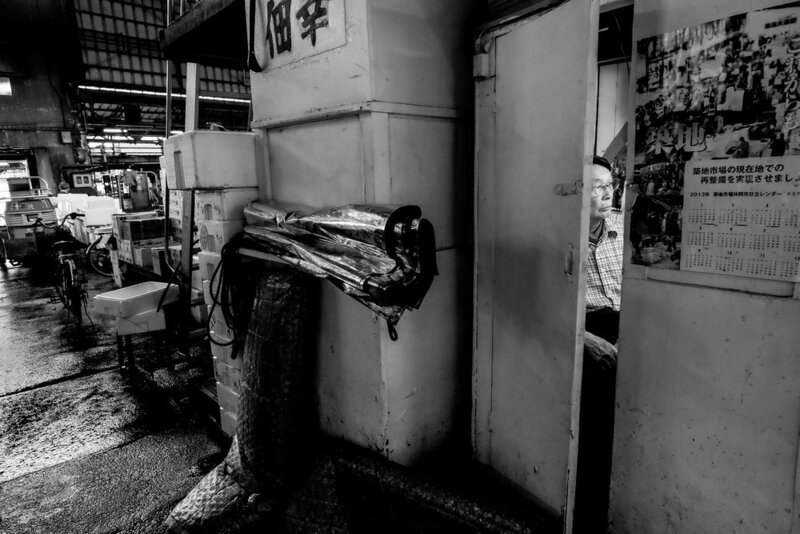 You can find pretty much everything that lives in the ocean at the Tokyo fishmarket. They even sold whale meat. I took some time for close-ups as these tend to be very graphical and as such could provide good imagery for the book. During our visit to the fish market I came close several times to take a taxi back to the hotel because I still felt terrible. But after an hour or two, I started to feel better and decided to continue our tour. Religion, spirituality and ceremonies are a very important part of the Japanese culture, so I really wanted to capture some of that for the book. Most temples are flooded with tourists but that doesn't detract from their beauty. Herds of tourists however make it hard to make pictures that reflect the respect you feel when entering this shrines, temples and spiritual places. I always try my best to be respectful of these places and the people who visit them as I shoot. Back on the busy streets, Kevin and I just happily snapped around and capture some more of the beauty and weirdness that seems to exist only in Tokyo. I'm always on the lookout for elegance and that's a quality that a lot of women in Tokyo posses, much more than in any other place I've visited. Despite the fact that nothing spectacular is going on in the picture, I'm still drawn to it for reasons that I can't exactly explain. But do you always need an explanation? 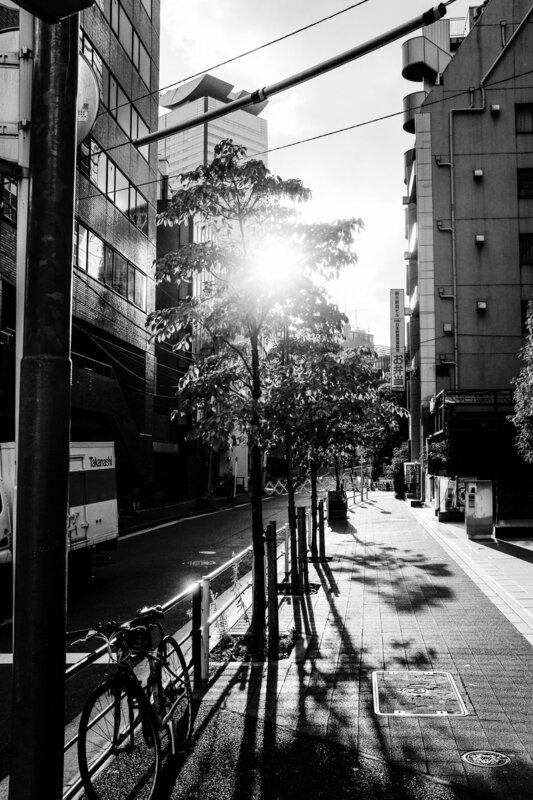 I've been in Tokyo three times at different times of the year but the light has always been stunning and inspiring. I'm still amazed that light can be so different in another part of the world. Next on our program was a visit to the Sky Tree, an impressive structure with an even more impressive view over Tokyo. Usually vantage points are nice but after fifteen minutes I usually get bored, even more so when the place is full of people. But this time it was different. When we got up there it was nice but we could see dramatic clouds slowly rolling in. We decided to stay up there hoping that the drama slider would be pulled to the right when the sun started to set. It's always a risk, very often the light gets worse, rather than better and you loose a couple of hours without anything to show for. We took the risk and it did pay off. The image below is probably my favorite from the trip. Although the dramatic clouds over the city were impressive, I felt the image missed some depth. So I tried to add some reflections of the people inside the tower. I made my composition and waited until I had the right silhouettes in my shot. 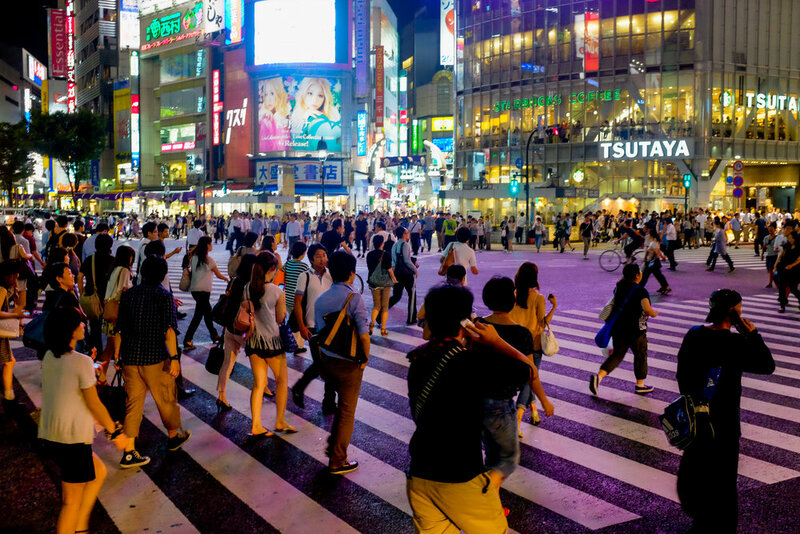 Shibuya Crossing is supposed to be the busiest pedestrian crossing in the world and has been featured in many movies. We spent quite some time there in order to try to capture the magnitude of the traffic. At first I couldn't get a shot that I liked but sometimes you have to work the scene to make the picture. The key to figure that out was to ask myself the question: "what do I FEEL here". The answer was that I found it almost frightening when the traffic lights turned green and it seemed like a wave of people was rolling towards me. I took that feeling and tried to translate that into a picture. To capture that intimidating wave of people coming towards me, I choose a slow shutter speed, waited until the light turned green, stepped towards the people on the other side and clicked the button. It took me a couple of tries but I'm still happy with this picture. I even sold it a couple of times as a fine art print. We ended the day with raw sea urchin, which Kevin and I agreed to, was the most disgusting thing we ever tried (although all the rest of the food during the trip was amazing). We needed a lot of beer to get rid of the sea urchin taste. Some photographers do a lot of research for a trip. I generally don't, I like to be surprised by what I find and react to that. Not doing a lot of planning, usually requires that you have the luxury of time unless you have someone local who can show you around. Kevin and I had double luxury by having Yuta and Yuto from Fujifilm who did everything to make our stay perfect. In the days leading up to our tourist day, we all spent a lot of time together and explained that we wanted them to surprise us and show us what they liked about Tokyo instead of what they thought we would like. We couldn't have had any better guides. If you want to take a photography trip, I highly recommend to get someone local to show you around. Tourist guides are an option but these people usually don't understand that you may want authentic experiences instead of safe, fake tourist stuff. Ask around, use social media to find people who live where you shoot. Thank you Yuto and Yuta to show us around and becoming friends for life. If you are ever in Belgium, I'd love to return the favor. I basically got carte blanche for the book. Fuji Belgium told me they wanted my impression of Tokyo. This is the best and the worst assignment you can get. It's the best because you get paid to do what you like. It's the worst because you have to hope that they like what you like and this can be a stressy thing. Not having a set plan for what I wanted to shoot required me to constantly re-evaluate my story. I quickly got the anchor points in place. 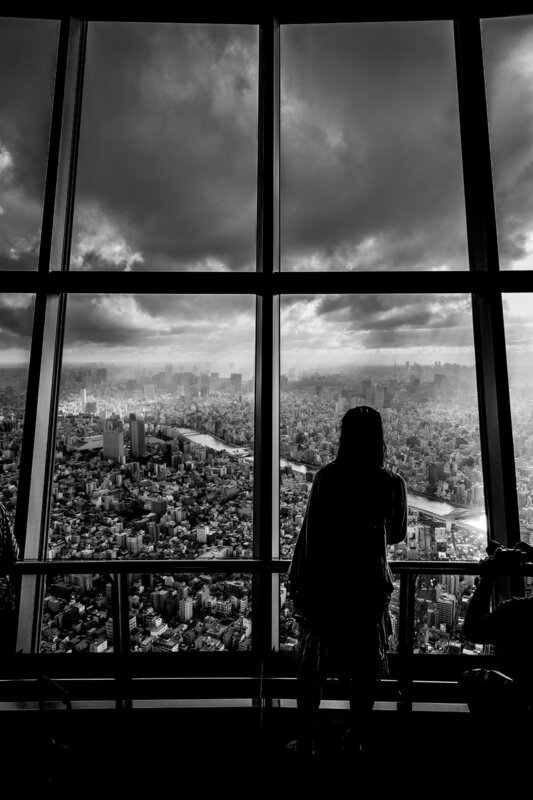 Tokyo is a place of extremes with very little in between and still it seems to work. Tradition is important but so is moving forward at light speed. I had a hard time understanding the Japanese culture although I have a lot of respect for it. This trip confused me a great deal. Sofia Coppola's "Lost in Translation" perfectly sets the tone of how I felt in Tokyo. The confusion and duality of Tokyo also had to be in the book, and I used my last two days to go after images to fill in the gaps. I probably shot 70% of the images in the book during that one tourist day. But getting those other shots was a lot harder work. It's easy to react to things that catch your eye but now I had to actively go and hunt for images that I needed. 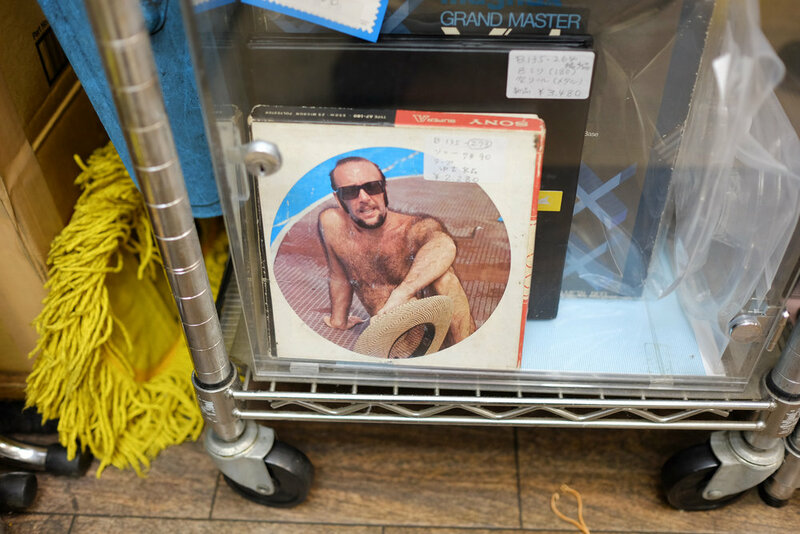 I started with looking for images that showed that although Tokyo often seems alien, there are parts were Eastern and Western culture mix or collide. In the Ginza district all the big high end fashion brands are present. There's something artificial about it but it's clear that a lot of Japanese are attracted to these luxury brands. This is the only time I used a long lens on this project. I spotted the Chanel sign and I waited for half an our on the other side of the street until I got some Eastern elegance in the picture to contrast with the Western icon. Before going to Tokyo I had this image in my mind of an ultra modern sci-fi city but that turned out to be an incorrect assumption. But technology definitely plays a part in Tokyo and so I needed some images that show that it is a modern city. There's no denying that through my Belgian eyes, Japanese culture has a bit of an unusual relation with sexuality. A short trip doesn't qualify me to make any statements about it but as a story teller I can still be honest by showing how I experienced it. To me it felt like there's an artificiality to it. There's probably a similar artificial objectification in Western culture but it's visually different. The last subject that I went for, was transportation. Space is limited and so many people are moving every single day that I often felt that I was disrupting the flow while taking pictures. During the morning commute there are millions of people packed in the metros but there's an eerie silence while everyone minds there own business. The work ethic of the Japanese people is famous and it's impressive how the collective goes before the individual when it comes to their professional lives. But when work is over, the Japanese love to show their individuality. I will never forget my first trip to Tokyo. It was confusing, exhausting and weird but at the same time I made friends for life and developed a deep appreciation for the Japanese people and their culture. One day I hope to return to see more of the rest of the country. Here's a video I made a while ago about the making of the book. It also includes my first experiments with a GoPro on my camera to show you my point of view when shooting on the streets. Fujifilm Tokyo and Belgium made this trip possible and I'll be forever gratefull for that.